An opening band consisting of high school students performs a Red Hot Chili Peppers cover. 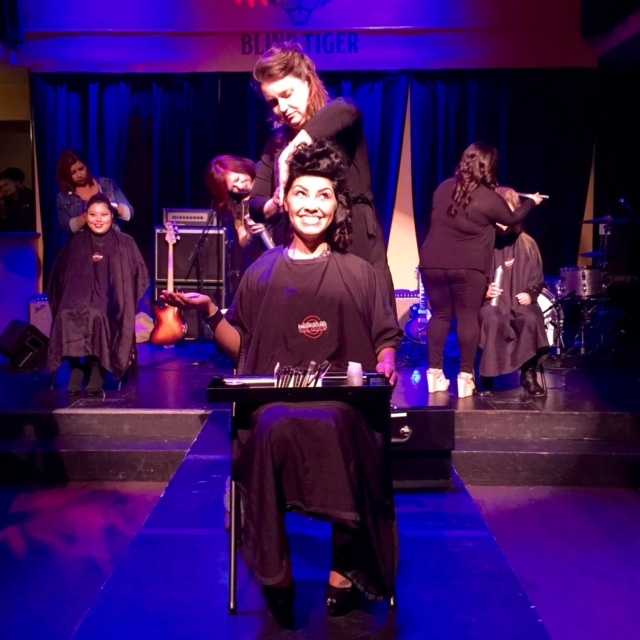 This Monday Underground Hair Artists took over Blind Tiger Bar and Lounge, hosting the group’s first ever Underground Culture Showcase: a night filled with runway hair fashion, live music performances, and food–an artist’s dream! Not to mention that the all-ages event was free. 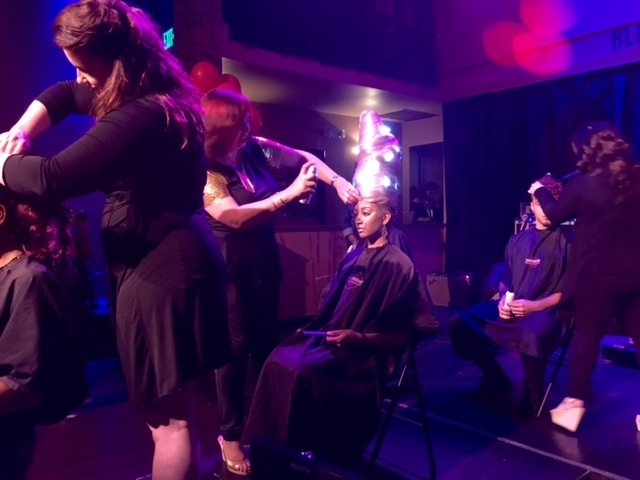 The event, hosted by area salon Underground Culture Hair, was put on in order to promote participation in arts, performance, and music for local youths. One dollar of each hair product the shop sells is donated to local charities and organizations geared toward helping foster creativity in Santa Barbara’s kids and teens. Makeshift music workshops booths were set up across Blind Tiger that included vocal coaches, Rockshop Academy, and Santa Barbara’s Youth Music Academy. An Underground Culture hairstylist gives a smiling model a futuristic new 'do. 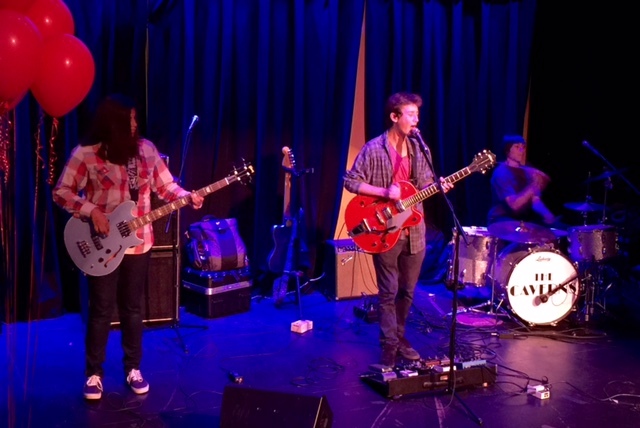 The three-hour music and arts showcase pulled in a surprisingly large crowd for 6:30 on a Monday evening, thanks to the fact that it was an all ages night. The audience ranged in age from 15 to 50, but make no mistake–this was a crowd with style. Showgoers of all ages wore leather pants, dramatic makeup, and tousled or gelled punk rock hairdos. Still, even the most fashionable attendees were bested by the models in the hair runway show. Near the end of the event, several models were brought onto the stage, each accompanied by his or her hair stylist. In less than 10 minutes, the models’ hair was transformed from ordinary to futuristic. One model even left the stage with two-foot tall hair adorned with tiny golden lights and chicken wire. Fay Doe, owner of Underground Culture, uses tiny golden lights and chicken wire to create a two foot updo. In addition to the show’s stunning visuals, the music was impressive. An assortment of young musicians, many of whom Underground Culture’s owner Fay Doe sponsored, jammed the night away on the Blind Tiger’s stage. While a number of the bands performed mostly cover songs, there was real musical potential in nearly every act. The event’s headlining band, The Caverns, was one of the first real rock n roll local bands I’ve heard. While their original songs are still maturing, their covers of Jimi Hendrix and Creedence Clearwater were both powerful and creative–a dynamic duo that’s hard to find in artists aged 19, 20, and 21. Hopefully in coming years the Underground Culture Showcase becomes less underground and gains traction in Santa Barbara–this year’s event hosted a number of talented artists, and my eyes will be peeled for next year’s show.